When PepsiCo, the world’s second-biggest food and beverage company, bought small fermented drinks maker KeVita in late 2016, it sent a clear sign that fermented foods have reached a tipping point. 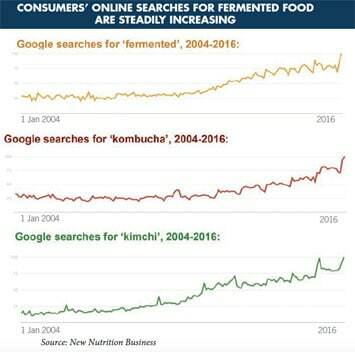 “Social media is buzzing about fermented foods,” says Julian Mellentin, author of New Nutrition Business’ new report Fermentation: how to make a trend into an opportunity. “The restless, food-explorer consumer can find a wealth of bloggers and online sources recommending kombucha and other fermented teas, sauerkraut, kefir, kimchi, pickles, vinegars, tempeh and a host of other fermented foods for their digestive health benefit. Against this tide of more interesting alternatives, yoghurt looks like a less exciting option,” he adds. Against 0.5% growth for the $6.9-billion US spoonable yoghurt market in 2016 (IRI), kefir experienced 16% sales growth, for the third year in a row. Vinegars, a $544-million market, grew 11.7%, with an average annual growth rate of 9% in the past three years, and kombucha, now a big and established business, grew by 7%. Smart companies will seize the fermentation opportunity now, at Day One, says Mellentin. “It’s a good time to take a calculated risk on a development that links to some powerful growth trends,” he says. Digestive wellness, the strongest and longest-lasting trend, is key to the success of fermentation. Consumers need to “feel comfortable inside” and they are increasingly opting for lactose- and gluten-free products, and plant-based drinks. Smaller categories offering more interesting routes to digestive health are achieving greater sales growth than dairy-based probiotics. Innovative start-up Rhythm Health spent nearly a decade developing a probiotic formula that would thrive in a coconut-milk based kefir drink. Its flagship product, a non-dairy kefir shot, is marketed as “100 percent natural” and with no added sugars, connecting with the widespread consumer belief in “naturally functional”, and the need to lower sugar intake. Fermentation also connects to the plant-based foods trend. Companies have already tapped into this need by creating single-serve vegetable-based snacks – a format that fits well with fermentation.